“We want to apologize for the part of this story that we did mess up. The team working closely with NBC around our Olympics partnership did proactively identify a tweet that was in violation of the Twitter Rules and encouraged them to file a support ticket with our Trust and Safety team to report the violation, as has now been reported publicly. Our Trust and Safety team did not know that part of the story and acted on the report as they would any other. NBC has been seriously criticized throughout the Olympics for its coverage of the London Games. The hashtag, “#NBCfail” even became a popular trend on Twitter. But when a journalist took things too far in his criticism of the network, he suffered the repercussions. Except it wasn’t even NBC that went through with the punishment. It was the social media platform he was using to speak freely. British journalist Guy Adams, a Los Angeles correspondent for Britain’s “The Independent,” had his Twitter account (@guyadams) suspended for the worst of his tweets. Apple has not made many friends in social media. Its relationship with Facebook, for example, has been strained since a deal to build Facebook features into Ping, Apple’s music-centric social network, fell apart. Facebook is also aligned with Microsoft, which owns a small stake in it. And Google, an Apple rival in the phone market, has been pushing its own social network, Google Plus. 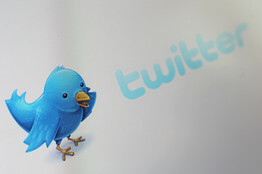 The Associated Press updated its staff social media guidelines today with a new section on live-tweeting news and an updated section on how to connect with newsmakers on social media. Journalists are instructed that live-tweeting public news events is fine, but their “first obligation is to provide full details to the appropriate news desk,” and they should not share “exclusive material” before giving the wire a chance to publish it first. Full excerpts of those sections are at the end of this post.